Hello! My name is Tabby. I’m a shy, sweet young girl looking for my purrfect match. I would love to find a place to perch, maybe watch the birds and squirrels outside. Then I can lounge on the sofa and take a nap. I would really love a nice, quiet home, with someone to love and spoil me. If that sounds like you, please apply for me today! I’ll be here waiting for you. 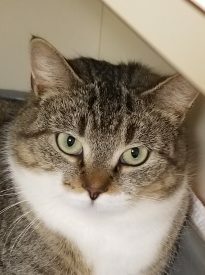 Tabby is a female DSH, approximately 1 year old, up-to-date on vaccines, de-wormed, SNAP Fe Tri tested, -x3, spayed, and will be microchipped before she goes home. 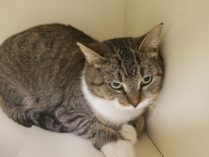 If you think Tabby is the one for you, please fill out an application in person, or on our website at lawrencecountyhumane.com. Tabby can’t wait to meet you!